When you need to send an email to someone that’s in a PDF format while using a MAC, you tend to receive an error whenever you end up actually sending your email. The error you usually get is that it was undeliverable. How can you avoid these steps? What can you do to prevent such problems from arising when you are in somewhat of an emergency? All you need to do is read the instructions provided by us below. We are sure that they will be of some help to you that is, if you are a Mac user. 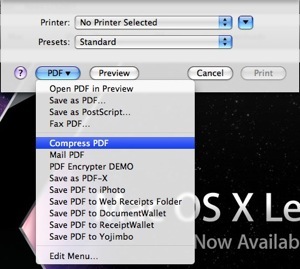 First off, locate the PDF file that you want to send of course, by compressing it. Open this file. Now, what you need to do here is choose the file that will show up on the top of your computer screen. Click the Print button. If you do not want to, or if you can’t, simply press the Command key along with “P”. When you press this combination of buttons, you will be presented with a drop-down menu. Now you have a drop down menu right on your screen. In this menu, look for button that is labeled ‘PDF’. It should be located on the bottom left hand side with an arrow next to it. Clicking on this button will open up another drop down menu right underneath the PDF button. This is where you want to click on the ‘Compress PDF’ option. This, too, will be visible in the drop down menu. A window will pop up and it will be showing the details of the compression process. Here we come to the last step. After the compression stage is complete, a window will come up on the screen, which will be a ‘Save’ window. Type whatever name you want to save it as. After you save it by the name you want to use, you should also decide on what location you want to choose for your file.